The notion of Choice provides a constant underlying theme to work in Systemic Functional Linguistics, whether this is concerned with in-depth description of the system of lexicogrammatical options available within specific languages, or with the analysis of the semiotic and/or social implications of the choices taken within specific texts. Yet, to date, little has been published exploring the applicability of choice across various contexts. 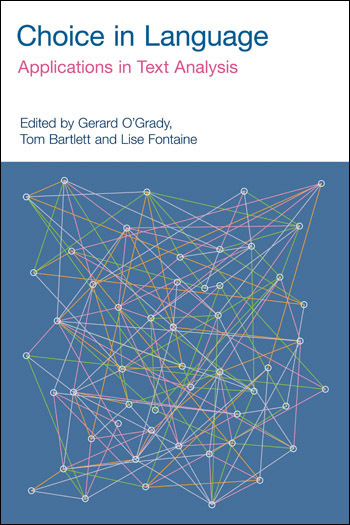 Choice in Language addresses this gap by presenting a selection of writings from internationally renowned authors that develop the analytical perspective of choice across wide-ranging contexts and, in some cases, in languages other than English. The book demonstrates the value of Systemic Functional Linguistics as an ‘applicable’ linguistics, which is a core tool in broader fields such as pedagogy, literary studies and critical discourse analysis. A valuable contribution to SFL… This book well displays the significance of choice and how choice works in meaning-making across various genres in English. Readers who are interested in SFL and discourse analysis will benefit from this collection. The present volume is testimony of SFL as an applicable theory which can be employed to tackle topics of varied nature.